Do you have this toxic plant in your yard? It might be killing wildlife. Extreme weather has always had a big impact on wildlife in southern Idaho. Some of the pictures of those impacts are humorous, like a moose that wound up in a homeowner's basement, or an elk that did the same. 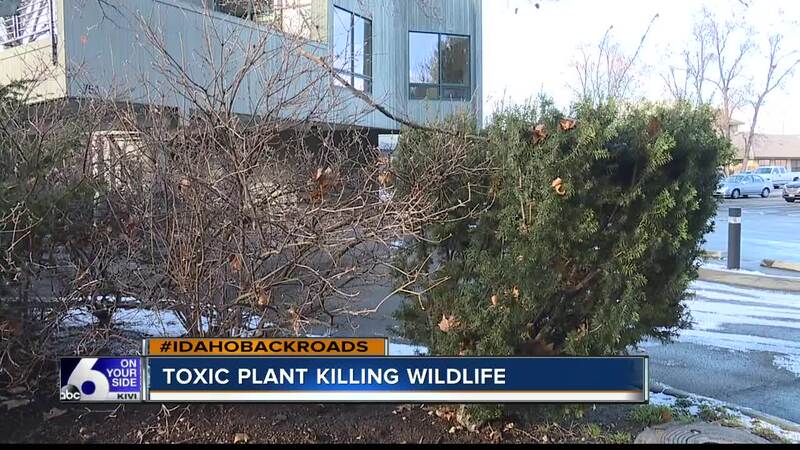 Some of the photos are not so pretty, like pronghorn antelope that died after eating a popular landscaping plant called Japanese yew. Idaho Fish and Game Botanist Lynn Kinter says it only takes a little plant to make a big impact. "It doesn't take much of these toxic leaves to kill an elk or a deer," Kinter said. Fish and Game has documented around 90 animals that died with Japanese Yew in their stomachs. An extreme situation, likely caused by our extreme weather which forced some big game animals to forage wherever they could find food: including the yards of people who live close to traditional winter range. Japanese Yew fills a particular niche in many landscapes because it grows well in shade, and stays green year round. In fact Kinter bought a house with Japanese Yew growing in the yard. Until this winter, she says she wasn't concerned. "Until this winter I haven't thought about it. I think most people are that way. They don't realize how something could be so dangerous in a particular setting," Kinter said. It is likely many people around the valley have yew growing in their yards, and don't even know it. When pruned, yew is difficult to discern from other evergreens. So what is the difference? "Japanese Yew has needles about a half inch long that grow in two directions. They are not as sharp as the needles on other evergreens," Kinter said. Zamzows' Nolan Guthrie agrees, yew is a popular plant, but says people who live where big game animals roam should look for non-toxic alternatives. "It's a good idea to get rid of them. There are other things you can plant that will do the same thing," Guthrie said. If you have yew, and are determined to keep it, Kinter suggests wrapping it in burlap during winter. In the case of large shrubs, she suggests trimming it back first. As for the yew in her own yard? "I have a dog that chews on sticks, so I'm going to get rid of it now that I know how toxic it is," Kinter said. Kinter says the plant is not a concern in urban areas. If you live in a location close to wildlife, it is probably a good idea to get rid of it. If you are not sure if a plant in your yard is yew, clip a sample and take it to your nearest garden shop or fish and game.